From 7 to 10 April, Vinitaly will return, the most eagerly awaited event among wine lovers! Duca di Salaparuta will be present, as always, with a full programme of activities and lots of novelties: guests, innovative Limited Editions, a stand purposely set up for the occasion, but especially the high-quality, sophisticated wines by Duca di Salaparuta, Corvo and Florio, which have always been the jewels in the crown of the Duca di Salaparuta Group. 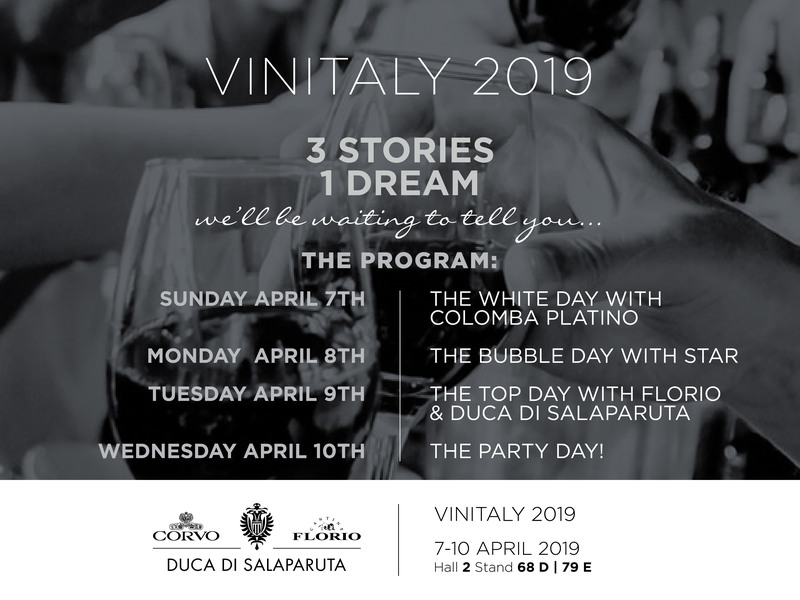 The undisputed stars of this edition of Vinitaly will be Colomba Platino and Duca Star Grillo & Müller Thurgau. These wines – the former elegant and evocative, the latter modern and stylish – have been revamped, revealing important changes and a new design. In addition, many exclusive guests and prominent personalities in the wine industry will come to visit us, which we can’t reveal now, but we are sure you already know them! Are you curious? Follow us on our official social media pages where you can watch the live highlights. We will give you a moment-by-moment report on all the latest news from Vinitaly 2019. You will find the Duca di Salaparuta stand in Hall 2, Stand 68 D and 79 E at Veronafiere. For detailed information on how to get to Vinitaly, please visit the official website.